Results: Researchers at Pacific Northwest National Laboratory have for the first time integrated microscopy methods with controlled cultivation to monitor microbial physiology in live bacterial biofilms. They are using nuclear magnetic resonance to map biofilm mass and quantitative metabolite concentrations and diffusive transport within biofilms. Systems studied include the environmentally relevant bacterium Shewanella oneidensis and Streptococcus mutans, an oral bacterium implicated in tooth decay. These efforts will lead to a better understanding of biofilm metabolic function. Their research results appeared in the February 2008 issue of The ISME Journal. The paper was recently listed in Faculty of 1000 Biology, an online research tool that highlights the most interesting papers in biology, based on the recommendations of over 1000 leading scientists. Why it matters: Biofilms are complex, three-dimensional bacterial communities found nearly everywhere in nature. These colonies adhere to surfaces and can have beneficial metabolic functions in, for example, environmental remediation; or detrimental functions, such as in human disease. Biofilms are very difficult to characterize because they are strongly light scattering, extremely fragile and vary significantly with depth. NMR is uniquely capable of providing non-invasive, depth-resolved metabolic, biomass and transport information—data that have not been obtained by other means. The non-invasive, non-destructive aspect of NMR allows scientists to perform comparative studies using a single biofilm, an important advantage for studying these highly variable communities. Methods: The scientists used three-dimensional NMR imaging to determine biomass volume and distribution with ~40-µm spatial resolution. 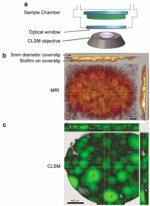 3-D confocal laser scanning microscopy, or CLSM, of fluorescently labeled biofilms provides complementary structural information at 1-µm spatial resolution. 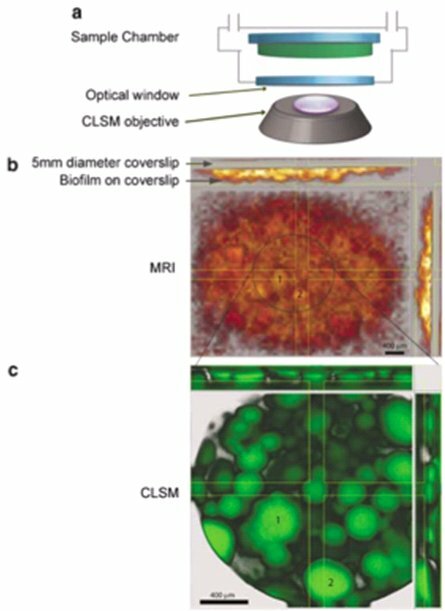 They used diffusion-weighted MRI to quantitatively measure the biofilm-depth-resolved diffusion rate for water, which is directly related to biofilm density and permeability. What's next: The team is improving the methods and hardware to increase NMR and CLSM sensitivity and resolution and improve growth-environment control. The improved system will provide depth-resolved, correlated metabolism and mass-transport information favorable for detailed metabolic modeling. They are also combining NMR/CLSM with stable isotope probing methods for the functional analysis of intact natural (mixed-species) biofilms. Further work is planned to investigate the spatial profiles of acidic organic acids within mixed-species oral biofilms on enamel surface to better understand the demineralization process that occurs in tooth decay. 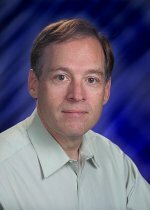 Research Team: The researchers include Paul Majors and former PNNL staff members Jeff McLean, now of the Venter Institute, and Ositadinma Ona. Acknowledgments: The research was supported by PNNL's Biomolecular Systems Initiative. Portions of the work were conducted in the Environmental Molecular Sciences Laboratory, a Department of Energy national scientific user facility located at PNNL. References: McLean JS, Ona ON, Majors PD. 2008. "Correlated biofilm imaging, transport and metabolism measurements via combined nuclear magnetic resonance and confocal microscopy." The ISME Journal: Multidisciplinary Journal of Microbial Ecology 2008 Feb 2(2):121-31.